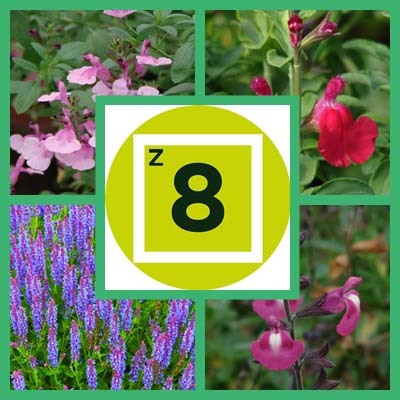 Development of Jame Sage (Salvia x jamensis) hybrids is rapidly expanding to contain a broad range of flower colors from soft pastels to brighter, more intense colors that are closer to the primary and secondary ranges. An example is our new series of Jame Sages called Elk Rainbow Sages, which range from pale pastels to brights and bicolors depending on what Salvias crossed to create these hybrids. However, one unerring distinction between Jame Sages and other hybrid Salvias is that, whatever sages are in the	S. x jamensis mix, both Autumn Sage (Salvia greggii) and Mountain Sage (Salvia microphylla) parentage is always involved. These species are native to the American Southwest and Mexico. The first ones collected were found as a genetic swarm near the tiny Mexican village of Jame (no s), located in Central Mexico where the eastern and western Sierra Madre mountains meet. Flowers by the Sea is developing numerous varieties of Jame Sage, in solids and bicolors, for ongoing introduction as part of the Elk Rainbow Series. These include a wide range of soft and bright blues, reds and yellows as well as secondary colors, such as oranges and purples. The unusual flower colors -- including many pastels and bicolors -- of these sages are a major key to their identification. Also, similar to Autumn and Mountain Sage, the flowers of Jame Sage have a wide, skirt-like lower lip. However, other characteristics of appearance also require consideration. Although the foliage of Autumn and Mountain Sage vary somewhat in size and appearance, they are good clues when determining the parentage of many Jame Sages. However, some of these hybrids have foliage of different sizes, textures and colors (gray to deep green) than Autumn and Mountain Sage. The lineage of Jame Sage may include species such as Coahuila Sage (	S. coehuilensis), Mexican Sage (S. darcyi) and Canyon Sage (S. lycioides). It may also include crosses with hybrids, of which there are so many combinations that we can't detail them here. But the broad height range of Jame Sage -- from 12 to 48 inches -- differs from both these species. Some shorter varieties of Elk Rainbow Sages show promise as groundcovers due to their matting growth. 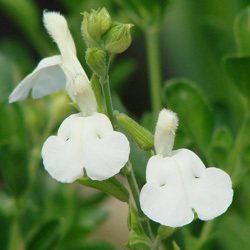 A sage's habit of growth -- such as its cultivation needs and bloom season -- also help to identify it as Jame Sage versus another kind of	Salvia hybrid. For example, Jame Sage hybrids are heat and drought tolerant as are Autumn and Mountain Sage. These hybrids love full sun similar to Autumn Sage. But like Mountain Sage, they tolerate more shade and moisture than Autumn Sage. As with the two central parent species, Jame Sage blooms from spring into fall and may slow down in the deep heat of summer. 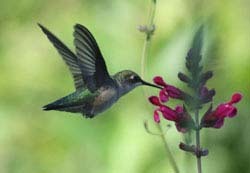 Jame Sage hybrids also match Autumn and Mountain Sage in drawing honeybees, hummingbirds and occasionally butterflies. We developed all of the Elk Rainbow Series at our farm on the Northern California coast near the town of Elk where Jame Sage grows beautifully. This ability to thrive in a relatively cool, often moist coastal climate versus the semi-arid mountain homelands of these hybrids says a lot about the adaptability of Jame Sages. Each Jame Sage hybrid that we select for development has	Elk in its name. That way you know it is an FBTS cultivar and that it is a reliable repeat performer. (VIBE® Ignition Sage) Never before have we seen such a pure white among the species to which Jame Sages are related. We love this purity as well as the bright green calyxes supporting the large flowers of Elk White Ice and giving it an overall crisp look. We believe this to be the best pure white Jame Sage. (VIBE® Ignition Sage) Never before have we seen such a pure white among the species to which Jame Sages are related. We love this purity as well as the bright green calyxes supporting the large flowers of Ignition White and giving it an overall crisp look. 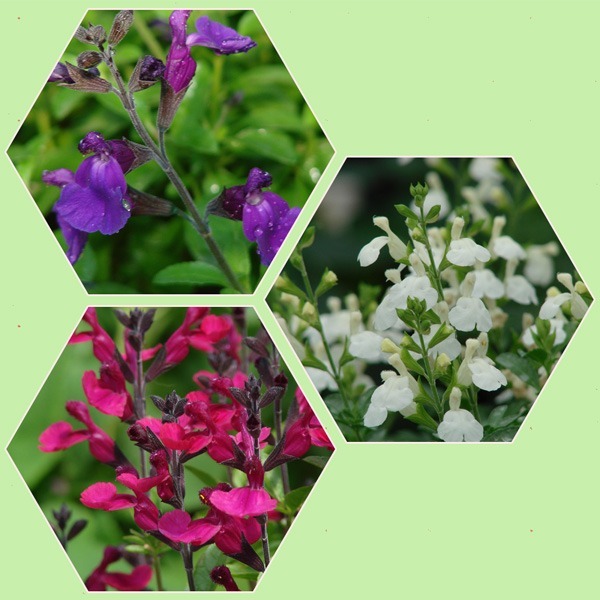 You'll find whites, brights, pastels and bicolors among the Jame Sage hybrids. This vigorous variety is well adapted to the chill of winter conditions in USDA Zone 7, and has survived in Zone 6 with winter protection. 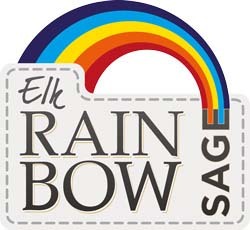 It is part of our Elk Rainbow Series of colorful, dependable plants. Native to Mexico and the American Southwest, Jame Sages occur in areas where the closely related species of Autumn Sage ( Salvia greggii) and Mountain Sage (Salvia microphylla) meet, such as near the Village of Jame in Mexico's Sierra Madre mountains or in the test gardens of our Northern California farm. This parentage may include other species of sages as well, which is why Jame Sages come in a broad range of sizes. The foliage of these hybrids can favor any of their parent plants. Elk White Ice has the tiny, smooth, oval-shaped leaves of the Autumn Sage side of its family. It is heat tolerant and loves full sun, but can take a bit of partial shade. 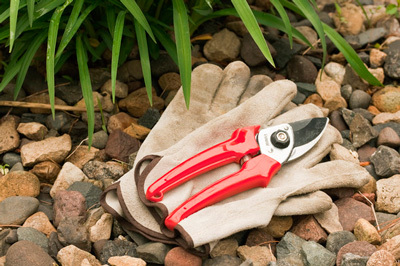 Although drought-resistant, VIBE Ignition White appreciates average watering based on local conditions. Don't forget to give it well-drained soil. When in bloom, VIBE Ignition White reaches up to 30 inches tall. Mass this upright plant in in a native garden with other, taller Salvias. 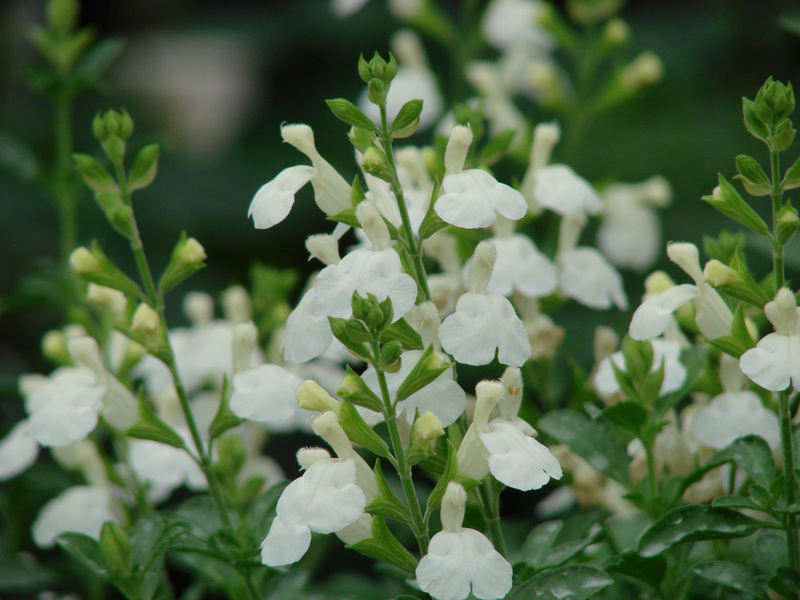 This variety was formerly sold as Salvia x 'Elk White Ice'. VIBE is a registered trademark of Flowers by the Sea. Visit the VIBE® Salvias website. At Flowers by the Sea, we regularly develop new cultivars such as our hybrid series of Elk Rainbow Sages™, which are varieties of Jame Sage Hybrids (Salvia x jamensis) in a broad array of solids and bicolors ranging from pastels to brights. 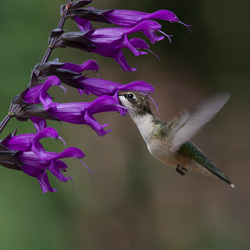 Attractive to hummingbirds and honeybees, they are lovely yet tough crosses that include Autumn Sage (Salvia greggii) and Mountain Sage (Salvia microphylla). 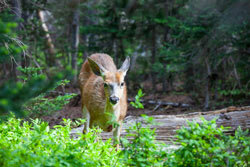 The word Elk in the scientific and common names of the Elk Rainbow choices indicates that you are getting a sturdy, colorful, reliable repeat performer. Moon gardens contain plants with pale flowers -- especially whites -- and silvery or variegated foliage that shine in moonlight. Some gardeners plant them to glow from afar when peering into the dark through a window. Others design these gardens for nighttime rambles. A number of white-flowered sages would be excellent additions to the dreamy design of a moon garden. If you want to orchestrate a peaceful symphony in a flowerbed, planting a profusion of pastels is one way to do it. Pastels are lighter hues of bright primary and secondary colors. Although gardeners often visualize bright colors when thinking of Salvias, there are a number of pastels in the genus such as among the Jame Sage Hybrids (Salvia x jamensis spp. ), including many in the new Flowers by the Sea Elk Rainbow Series. This one is certainly a keeper. It is simply stunning. Blooming its fool head off in mid 90 degree dry heat, in full sun, zone 9b southern California. The flowers are such a lovely snowy white and the foliage is a nice pure green. Quite out blooms a S. greggii white that I bought locally. doing well, growing taller. It was a small salvia when I received it but it has lots of unopened blooms. This little stunner has been a prolific bloomer through summer temperatures in the 90s to fall lows in the 40s. It's planted in front of the slightly taller Radio Red, a striking combination. Far superior to previous trials of Heatwave and Patens whites. (Salvia VIBE®'Ignition Purple') Purple once was a color reserved for royalty. 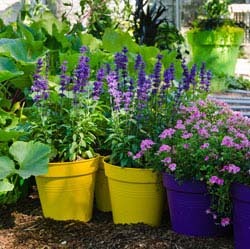 Salvia VIBE® 'Ignition Purple' has deep royal purple flowers that are rare in a Jame Sage hybrid. They bloom spring to fall for your enjoyment. (Elk Screamin' Scarlet Sage) Wow. No, double wow. This brilliantly colored new variety is nothing short of stunning. The glossy green leaves are the perfect foil for the flowers, which at times are so numerous that the are all you can see. (Elk Bright Eyes Sage) Dark green and red calyxes support the raspberry-red flowers of Salvia x 'Elk Bright Eyes'. The pink throats of the blossoms are topped with white beelines, or eyes. This is a unique and eyecatching color. (VIBE® Ignition Fuchsia Sage) A perfect companion to our Best of Breed 'Ignition Purple', Ignition Fuschia has velvety deep fuschia pink flowers that are rare in a Jame Sage hybrid. They bloom spring to fall for your enjoyment. (Elk Bella Rosa Jame Sage) The large, creamy pink and burgundy flowers of this sage are stately in contrast with its deep green, veined, ovate foliage that is pleasantly fragrant. Elk Bella Rosa is as elegant as its name implies. It's also long blooming. 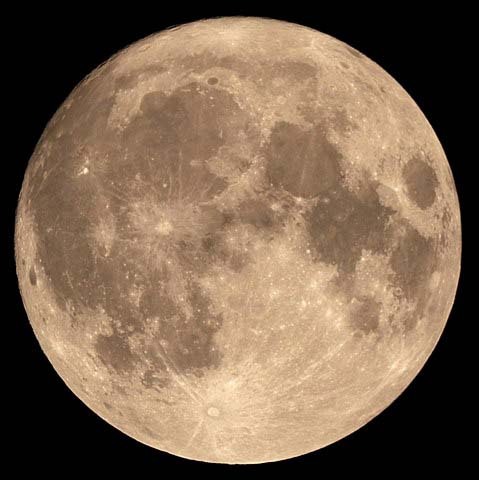 (Elk Blue Moon II Jame Sage) The phrase "blue moon" signifies a rare event. Elk Blue Moon Jame Sage is an unusual combination for a Salvia x jamensis hybrid -- dusky violet flowers with pale-blue throats, dark blue calyxes and mid-green foliage. Note: This is a new (2014) cultivar that we chose to replace the original 'Elk Blue Moon'. It is a superior grower, and otherwise very similar. (Elk Chantily Lace Jame Sage) What color are the flowers of this FBTS introduction? Lavender? Periwinkle? Taffy? Yes to all for this hard to describe but easy to love plant. (Elk Cotton Candy Jame Sage) Rosy hairs on the upper lip and pale white throats highlight the translucent, blush pink blossoms of Elk Cotton Candy Jame Sage. Dark, deeply contrasting calyxes support the medium-size flowers. (Elk Lemon Light Jame Sage) We are proud to offer this luminescent, pure yellow Salvia x jamensis -- a color breakthrough from our own breeding program. The bright, light blossoms cool the landscape similar to white flowers, but with colorful impact. The glossy green leaves are quite small - a very attractive and distinctive characteristic. 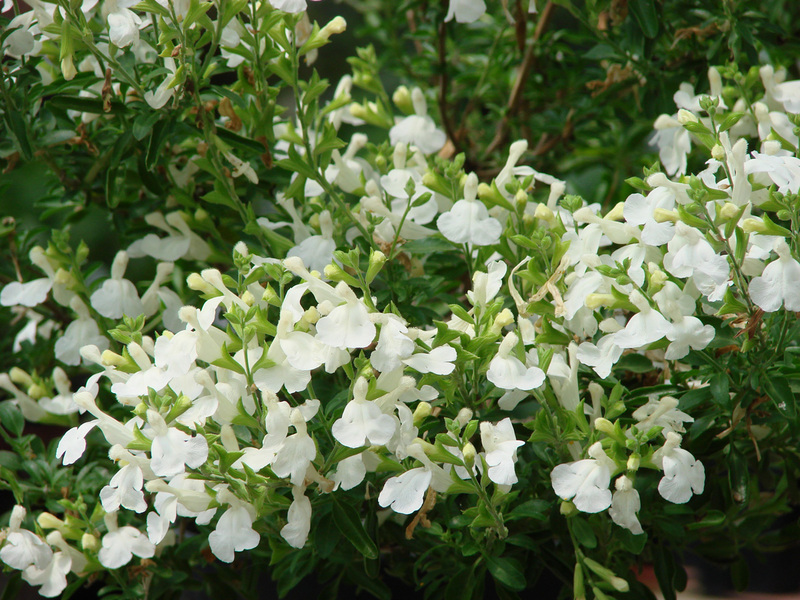 (Elk Lush Lavender Jame Sage) Pale white accents mark the throats of this sage's large, rich lavender flowers. In contrast, the calyxes cupping the blossoms are a dark blue-green. Overall, the look is serene. (Elk Plum Parfait Jame Sage) It's a toss-up as to which are more dramatic -- the deep purple calyxes so dark they almost look black or the plum-colored flowers with pronounced white beelines. Elk Plum Parfait is a rare treat. (Elk Twilight's Rosy Glow Jame Sage) Rosy red hairs accentuate the upper lip of each dusky, salmon-pink blossom of this cheery Jame Sage. The flowers are tiny but abundant and are supported by bright green calyxes. (Elk Raspberry Moose Sage) The deep raspberry flowers of this Salvia x Jamensis look good enough to eat, like spoonfuls of a silky, mouthwatering mousse dessert. Yet the 'moose' in its name isn't a misspelling. It refers to flowers that are larger than normal for a Jame Sage.